On a recent visit to our local Farmers’ market, I came across a store selling a wide assortment of pasta. I’ve never seen so many different varieties, colors and flavors of pasta in one place before! I spent a good deal of time in that particular store alone trying to pick out something I’d never used before and finally settled on this pretty looking pinwheel pasta. After coming back home, this was pushed to the back of my pantry and was forgotten about until a couple of days back. I then decided to use it along with whatever vegetables I had on hand to make this tasty dish. On a baking sheet, toss the carrots, onions, peppers, grape tomatoes and garlic with olive oil, salt, pepper, red chilli flakes and dried herbs. Roast until tender for about 35-45 minutes. Meanwhile, bring a large pot of salted water to a boil, add the pasta and cook according to the package instructions or until al dente. Reserve some pasta water to make the sauce and drain off the rest. In a large bowl, pour the roasted vegetable sauce over the pasta and toss to coat. Stir in the chopped fresh basil and sprinkle with Parmesan cheese on top. I’m sending this over to dear Ruth for Presto Pasta Nights. The pasta really looks good!! wow! never seen that kinda pasta before. 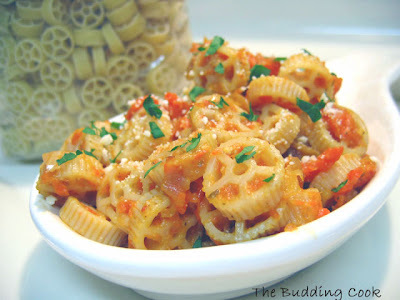 Wow those pinwheels look delicious smothered with the pasta sauce. I was reading it as pinwheel pasta in a ROTATED vegetable sauce! 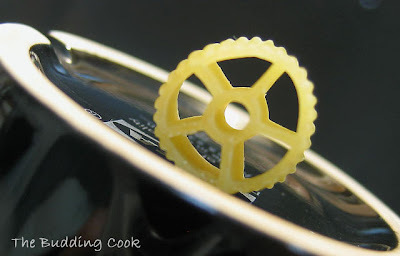 This pasta looks nice, the pinwheel shape is new to me. I love that first picture... very catchy! :) Roasted vegetables and pasta is a favorite combination at our place too... looks great with the parsley and parmesan. Isn't it amazing, the kind of treasures one finds at the farmer's markets! The first picture is really awesome, so is the recipe! That sure is pretty T, now this reminds me, I have a bag of Elk shaped pasta which I bought in IKEA (of all places! )...will try it with this recipe ;) Looks yummy! Delicious recipe TBC,I like the roasted vegetable sauce. Pinwheel pasta looks very cute and colourful. Looks yummy and colorful. Loved the first picture. lol, I can so relate to the story of picking up something new from a store with so much enthusiasm only to forget it among the hundreds of jars in the pantry... Good you remembered before it was too late... That is too pretty a pasta to waste.. I've never seen this pasta! looks cute though! Oh, that pinwheel pasta looks so cute! And such a creative use of ingredients, TBC. The prepared dish looks lovely and very appetizing. What a fantastic dish of pasta! Thanks for sharing with Presto Pasta Nights! Yeah, that IS true. I remember fryums. I used to love that. I'm glad my pic made you nostalgic. Your lovely, heartwarming writing always does that to me! I love the look of that pasta! This combination of veggies sounds wonderful--and a cute little pasta shape doesn't hurt, I'm sure! This is such a great dish! I love pinwheel pasta! I love the first pic. what a cute pasta, I have never seen it!It s gotta capture the sauce really well. That picture is so cute! And the pasta looks hearty and delicious. Hi sweetie, I am trying to catch up my reading here... you've been cooking so many good recipes! The muffin liners are so cute!!! We only get white ones here, hahah. You have some fantastic photographs here - great work! I just discovered your blog. Lots of tasty dishes! Zlamushka- there were so many beautiful shapes there! I found it so difficult to pick just one! Roopa U.- thanks for stopping by. Latha!!! How have you been? I kept checking for updates. Hope your mom has recovered completely now. U have wonderful site and some breath taking pictures ..
Jaya- thank you so much! It means a lot to me!